It’s that time of year when, despite the gloomy weather, our thoughts turn to spring cleaning. 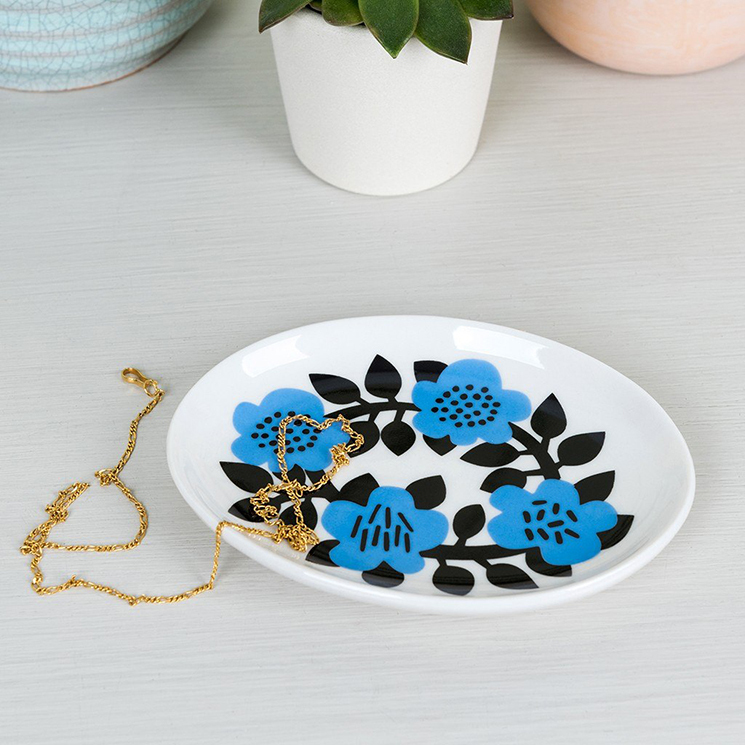 Whether you’ve caught the Marie Kondo tidying up bug, or you simply feel like the clutter in your home has snuck up on you, we all know how good a good tidy up and clear out feels. To help you get started, we’ve put together a few tips to help you declutter and organise your home, room by room. 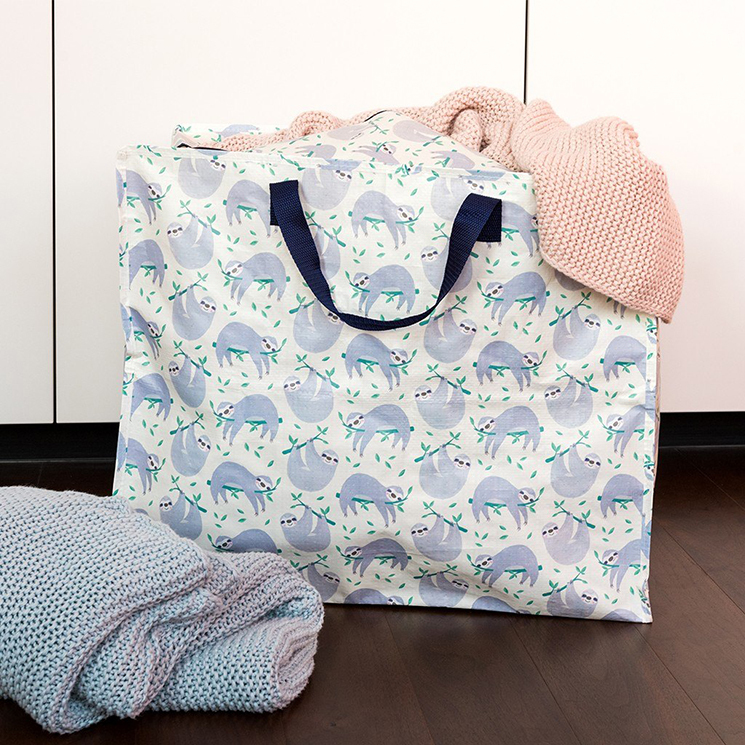 Get organised with a jumbo storage bag. Neal Layton limited edition jumbo storage bag, £4.95. 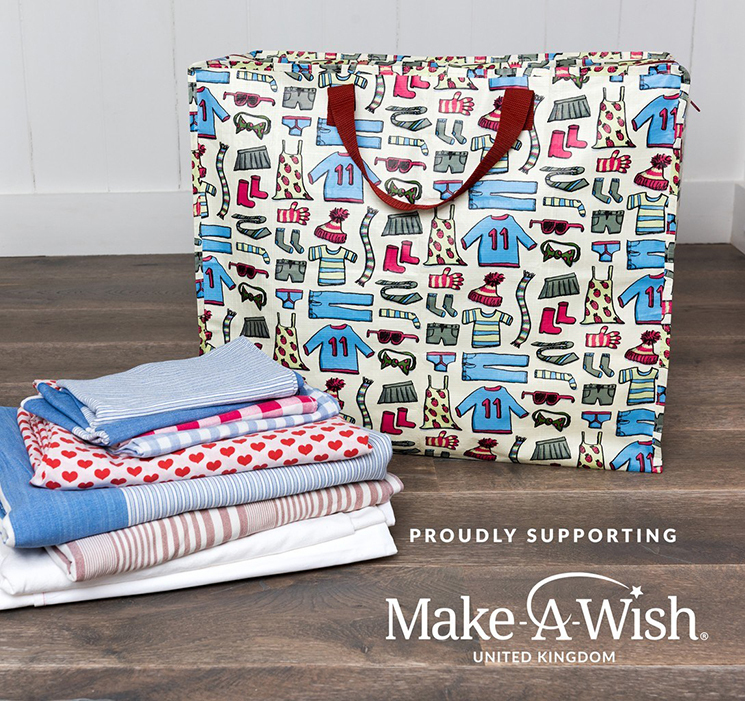 All proceeds go to Make-A-Wish UK, helping them to create life-changing wishes for children with critical illnesses. Throw out any expired products or items that you just didn’t get on with (we’re looking at you, face mask that promised the world). A handy tip for checking if something is in date is to look for the little symbol on the packaging - it looks like a little jar, and has a number like 3m or 24m. This tells you how long a product is good for - so 3m means 3 months, and 24m would mean 24 months, or 2 years. To avoid the problem repeating itself, try and promise yourself you won’t buy anything new until you’ve used up everything you already own. Tricky, we know! 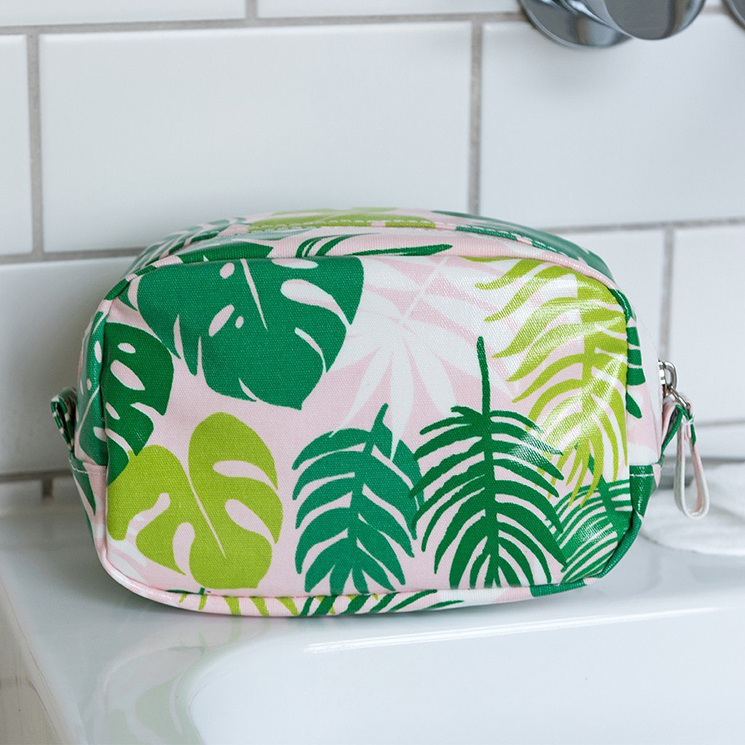 Use some funky makeup bags to store and organise your products either by type (make up, nail care, medicines) or by frequency of use, so your everyday items are always close to hand. Save your bathroom cupboard for those bottles of toilet cleaner that you don’t particularly want on display. Free up some space by having your towels on display. There are lots of creative ideas for how to do this on Pinterest. 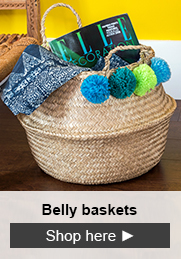 We love the idea of popping them in a belly basket for a practical and stylish design accent. This stylish bathroom also features a handy string bag for bathroom linens. The kitchen is most likely to be the room with the least amount of sentimental items, so you can afford to be a bit more brutal in here. There’s a good chance you’ve picked up lots of tools and gadgets that have only been used a handful of times. Ask yourself honestly if you really need six different sizes of cake tin, or how often you’ve used that camembert baking dish. Cookbooks can take up lots of space. Take photos of your favourite recipes and save them to your phone so you’ve got a digital recipe book, or add the image to Pinterest and create a delicious foodie board. 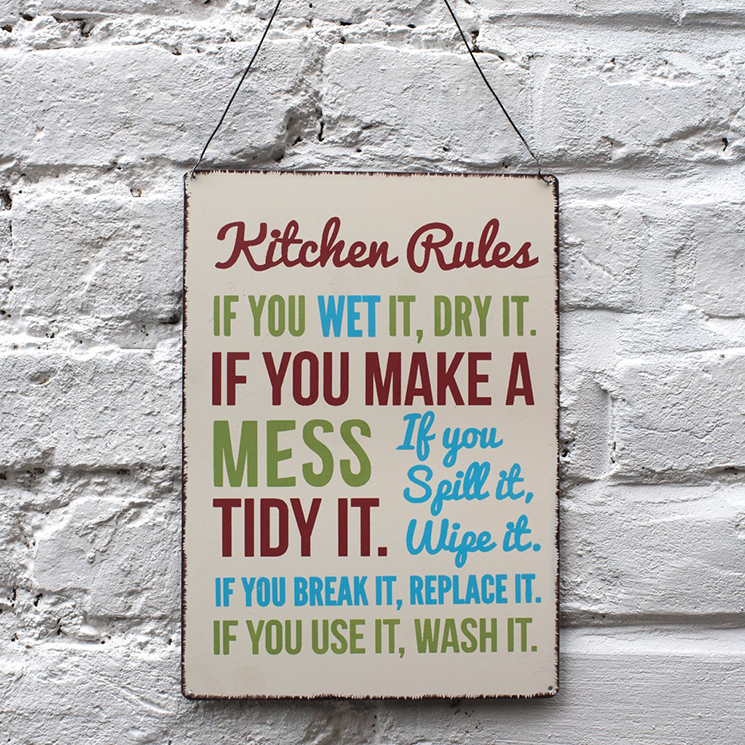 A retro sign in the kitchen serves as a handy reminder for anyone using the kitchen to try and keep it clean! Never underestimate the space under your bed. Making the most of this hidden area can free up lots of cupboard and side table space. 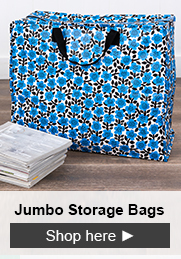 Use jumbo storage bags to store spare blankets, winter wardrobes, infrequently worn bags and shoes, and much more. If your wardrobe is bursting at the seams, but you wear the same old clothes day in day out, you’re not alone. The classic statistic goes that we wear 20% of our clothes 80% of the time. We love the idea of trying the ‘Oprah hanger challenger’ - hang all your clothes with the hangers facing in reverse direction. Next time you wear an item and hang it back up, put the hanger on the right way round. In six months, see which clothes are still hanging on reverse hangers. There’s a good chance that these can go straight onto your ‘donate to charity’ pile. Decluttering isn’t just about getting rid of stuff; it’s also about taking care of and organising the bits that you do have. 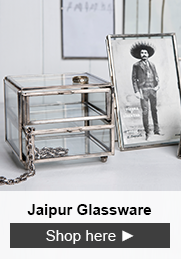 Give all those loose little accessories a dedicated space that you’ll be proud to display using a trinket tray or set of drawers. 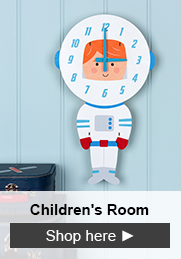 Need some ideas for tackling for the kid’s room? 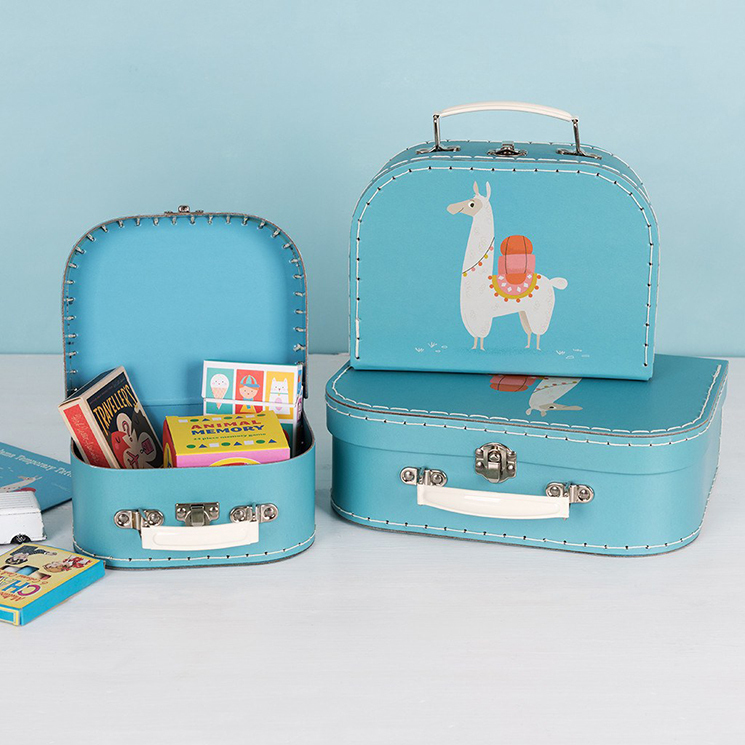 Take a look at our blog on how to organise a kids room. If your home has a study or desk space, that area can become a magnet for clutter, with piles of papers, notes, stationery and more. 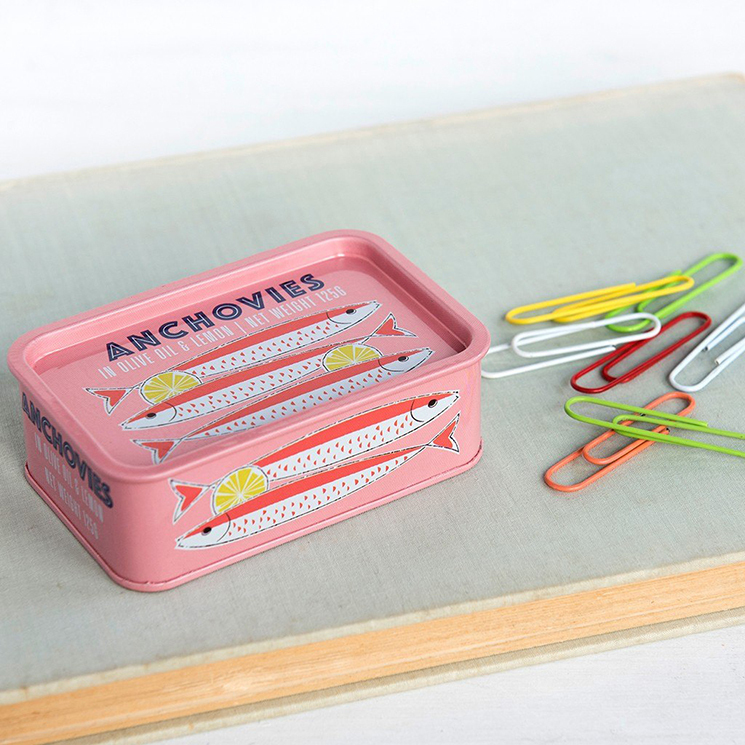 Read our 8 simple ways to organise your desk space to help you tackle this. Our jumbo storage bags are incredibly versatile and can be used in the home, garden, or even car. Take a look at this infographic on how to organise your home with jumbo bags. A family command centre might be just what you need to take control of your household. Here’s our guide to organising your life with a command centre. If you want to turn all this decluttering into a bit of fun, give yourself a declutter challenge, such as this 30 day challenge from Popsugar. It includes a downloadable print out so you can keep yourself accountable. Enjoy giving your home a declutter! We’d love to see all the ways you use your jumbo storage bags, so be sure to share them with us using #RexLondon.